Sign up for the National Science Teachers Association’s 2016 Area Conference on Science Education in Minneapolis: October 27–29! The conference themes focus on STEM instruction across the curriculum, teaching science in a connected world, and elementary science and literacy connections—and will explore ideas and practices that enhance three-dimensional teaching and learning. There will be over 275 sessions many focused on the conference strands: STEM instruction, Connecting Elementary Science and Literacy, and Teaching Science in a Connected World. STEM Day at the Fair was a great success again this year! This year, thanks to generous support by MTS Systems, we offered an event app allowing parents to connect with our exhibitors and performers throughout the year. The app is live and can be found at stemdaymn.org. It includes the schedule of our great mix of returning performers and new ones. 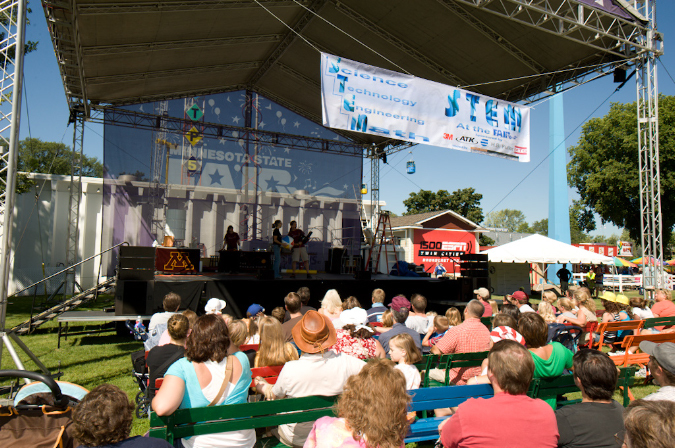 The Minnesota STEM Network’s 6th annual STEM Day at the State Fair in Carousel Park was brimming with STEM activity made possible by exhibitors active in the STEM Network and our generous sponsors, 3M, Boston Scientific, MTS, and Thomson Reuters. Over 7,000 people came through Carousel Park on STEM Day making it the best attended in our six year history. Thanks to our committee, exhibitors, and sponsors for the time, effort and investment in STEM Day. We look forward to another fun-filled day next summer! Please thank our generous sponsors. Download the flyer to share with your networks and audiences! 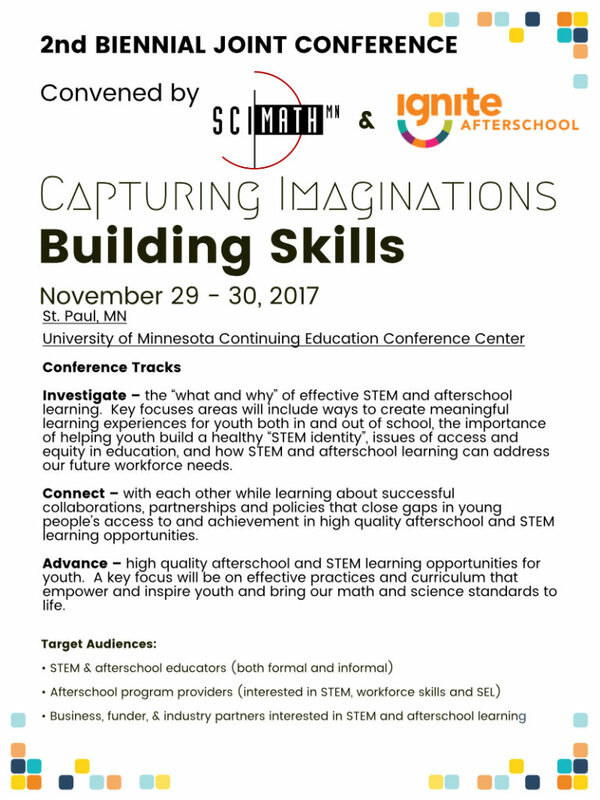 For the 2015 conference, the Minnesota STEM Network is partnering with Ignite Afterschool network to feature Science, Technology, Engineering, and Mathematics (STEM) in afterschool and the development of 21st Century skills, such as problem-solving, teamwork, and communications. This two-day conference brings together these networks to ensure every Minnesota young person has access to high quality STEM Education and opportunities to build 21st century skills in afterschool. Attendees will share high quality practices, build partnerships, and advance policy to increase student engagement in and outside of the school day. Dr. Lisa Regalla is the Deputy Director at Maker Education Initiative. In her previous role as the National Program Director, she led Maker Corps, a program that builds the capacity of youth-serving organizations to engage youth and families in making, and Maker VISTA, an AmeriCorps initiative that builds thriving Maker Hubs within high poverty communities. Prior to Maker Ed, Lisa worked at Twin Cities Public Television where she was responsible for the educational content presented on television, in person, in print, and on the web as part of the Emmy-Award winning series, SciGirls and DragonflyTV: Nano. Lisa received both a B.S. in Chemistry and a B.A. in Theater from Lehigh University before earning her Ph.D. in Chemistry from the University of Florida. Prior to joining Oregon State University in June of 2014, Martin directed the Board on Science Education at the National Research Council of the National Academy of Sciences. There he oversaw studies that addressed a wide range of issues related to science education and science learning, from informal learning to reforms in K-16, and provided evidence-based advice to decision-makers in policy, academia and educational practice. Martin works in the intersection of research, practice and policy. He has previously worked for education and policy non-profits in Germany and the United States. He holds Master’s degrees in biology and public policy, and a Ph.D. in education. These Keynote Speakers are made possible by the Federal 21st Century Community Learning Centers Program, NCLB, Title IV, Part B, CFDA 84.287C, administered through the Minnesota Department of Education. Exhibitors and Sponsors: Please contact Matthew.Ramirez@state.mn.us for more information. STEM is now a much-debated and, perhaps, much-hyped topic for educators, policymakers, and theoreticians. As advocates for STEM education, we must consider whether we’re nearing the zenith of interest in STEM, whether our efforts to expand access to STEM resources is as inclusive as it should be, and what must we do to ensure STEM remains at the forefront of education policymakers’ and problem-solvers’ minds. Triangle Coalition is seeking proposals for its 14th Annual STEM Education Conference that will address these and other critical questions for the STEM community. New this year, we are also accepting proposals for pre-conference webinar presentations. All proposals must be submitted by 5:00 PM ET on Friday, June 27, 2014. Learn more in the Call for Presentations. Come and meet others who are passionate about STEM. Learn about what’s going on in the STEM community. Get engaged with the MN STEM Network. Learn how a business like Microsoft supports the STEM community. The Microsoft Technology Center is a collaborative environment that provides access to innovative technologies and world-class expertise, enabling you to envision, design, and deploy solutions. Microsoft partners with various schools, community organizations, and government agencies to offer students an inside look at Microsoft and the different career opportunities in technology. One of their signature programs is DigiGirlz, which provides high school girls with a better understanding of what a career in technology is all about. They also host “Community Days” which offer free consulting for non-profits. CEHD’s policy breakfast series brings a research focus to the conversation about closing Minnesota’s achievement gap. Five policy breakfast events will examine the role of school leadership, early childhood education, reading and literacy, STEM education, and teacher preparation. Each event discusses the ways CEHD research can inform Minnesota’s education policy. As the US moves toward implementing the Next Generation Science Standards (NGSS) and Minnesota reviews them, how can we embrace these developments and help inform policy decisions? What are the implications of the recent national reports such as A Framework for K-12 Science Education: Practices, Crosscutting Concepts, and Core Ideas, Developing Assessments for the Next Generation Science Standards, and STEM Integration in K-12 Education: Status, Prospects, and an Agenda for Research for improving science education? What sort of policy support can help move them into widespread use? Join CEHD and UMN President Eric Kaler for a discussion of NGSS, STEM integration, and Minnesota’s assessment policy. Dr. Heidi Schweingruber, Deputy Director of the Board on Science Education at the National Research Council, will deliver a keynote address followed by a response from a local panel. A continental breakfast will be served free of charge, and parking in the Washington Avenue Ramp will be validated.